Everyone remembers the rags-to-riches tales – the Horatio Alger stories that still holds true in America. If you work hard and labor long hours, the “American Dream,” in the broader sense, is possible. Take for example, Chris Maragos, Jordan Hicks, and Trey Burton, NFL Ballers who turned out to be Super Bowl Champions. A captain for the 2018 Super Bowl champions, the Philadelphia Eagles, Chris has already earned two coveted Super Bowl rings. And during the 2018 championship game, Trey made a big impact in the game by throwing a touchdown pass on a trick play, coined the “Philly Special,” to Eagles quarterback, Nick Foles. Jordan is also a Super Bowl champion, as a member of the 2017-2018 Philadelphia Eagles. 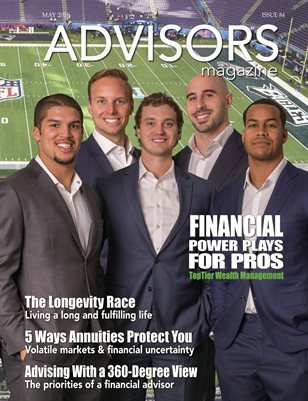 This football trio has teamed up with TopTier Wealth Management partners Austin Nelson and Michael Brusko to build a financial firm dedicated to the needs of professional athletes to help protect their retirement and legacy.